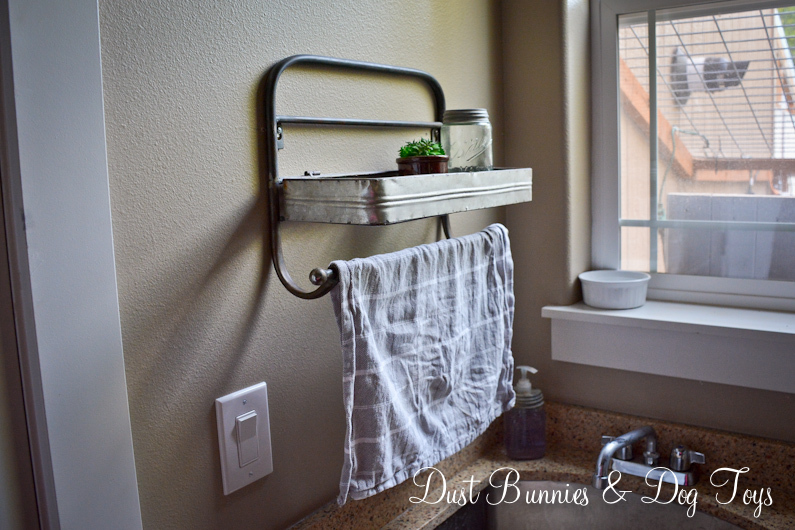 Today I’m sharing a quick addition I made to the laundry room. Now that we’ve got the counter top finished and the sink operational I found that we needed a spot for a hand towel to dry your hands. 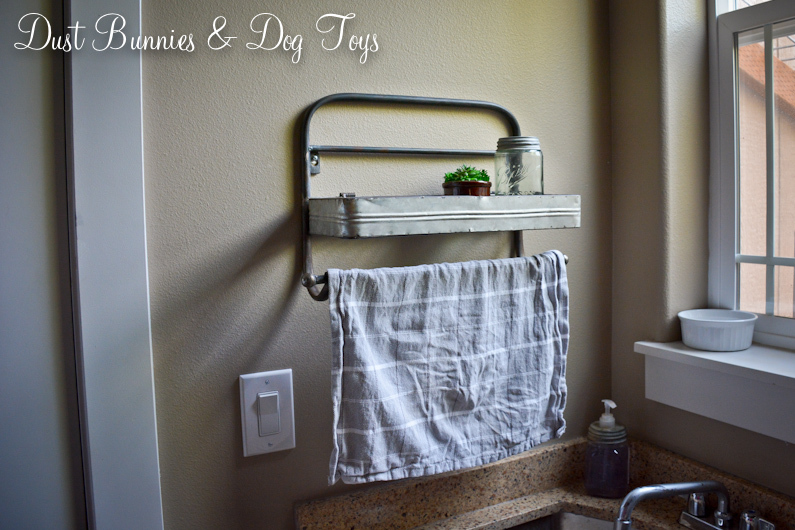 I’d been eyeing this vintage industrial style shelf and towel bar for a while so when I spotted it for a good price I ordered it quickly, figuring it would either work in here or the guest bathroom. Due to shipping costs I had to have it sent to my Mother-in-Law’s house and wait to pick it up until our trip earlier this summer. This spot has had several variations since we moved in. First I had some DIY decor here, then there was a rustic laundry sign, but I decided to sell that and have a different one made for the wall above the board and batten on the other side of the room where the tobacco baskets are currently. Those will move to the guest room above the new headboard. I plan on making that change this winter, when there’s not so much going on in the yard. The metal look ties in perfectly with the DIY drying rack the Hubs built me above the window. 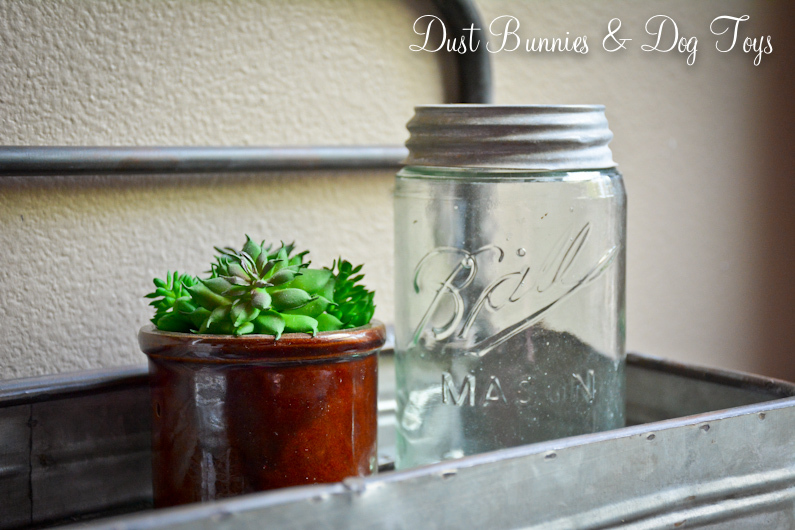 I styled it with one of my faux succulent planters and a blue mason jar that I’ll be filling with vintage clothespins. I may add a few other little things, but will let those “find” me in the coming months. You can’t tell from this angle but the bottom of the shelf is an open style wire so whatever I use on it will have to be big enough that it does’t fall through.